Immunofluorescent analysis of ( 4% PFA) fixed MDCK cells using CL594-66200 (acetylated Tubulin(Lys40) antibody) at dilution of 1:100. Tubulin, composed of heterodimers of alpha and beta tubulin, is the mainly component of microtubules which play important roles in cell motility, mitosis, and intracellular vesicle transport. Both alpha and beta tubulin undergo several posttranslational modifications such as polyglutamylation and acetylation/deacetylation. Tubulin acetylation occurs on lysine-40 at the N-terminal of alpha tubulin and is conserved across species. The histone deacetylase HDAC6 and SIRT2 has been identified as tubulin deacetylases. Reversible acetylation of alpha tubulin may be implicated in regulating microtubule stability, cell motility, and axon regeneration. The level of acetylated tubulin has been linked to epithelial malignancies and sensitivity to chemotherapy. In addition, acetylated tubulin has been widely used as a marker for primary cilia. 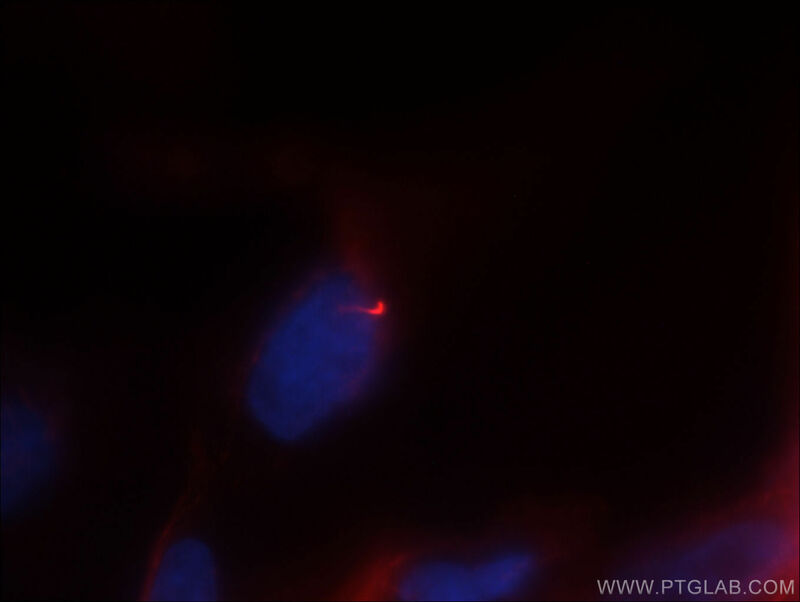 This antibody is specific to the acetylated tubulin; it does not recognize non-acetylated tubulin. (24268707, 23881549) And this anitbody is CL594(Ex/Em 593 nm/614 nm) conjugated.